On March 11 and 12, Curtis Hixon Waterfront Park will play host to 40 diverse bands and performers at Tampa’s sixth annual Gasparilla Music Festival (GMF). 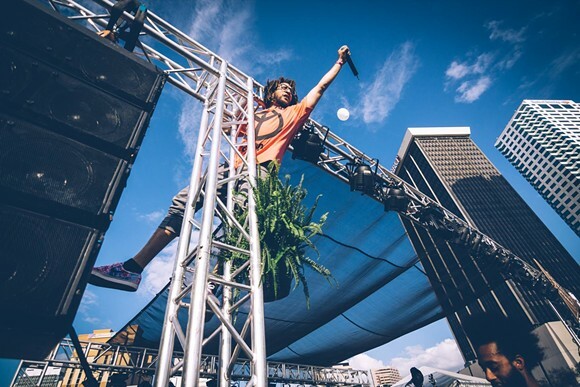 Students staying local for spring break next week will have the opportunity to catch headliners Cage the Elephant, Ryan Adams and Ghostface Killah, among others, right across the Hillsborough River. Organized since 2012 by community nonprofit group Gasparilla Music Foundation, the festival aims to promote Tampa’s local, organic arts efforts and to bring the community together through music performance. The Foundation has tapped young, independent talent from the Tampa Bay area that contributors feel deserve recognition for their craft. The festival’s four riverside stages will represent a wide range of genres; emerging indie reggae-rockers Parrotfish might play a set next to St. Petersburg’s Mt. Zion Gospel Choir (the official set schedule has yet to be released). In addition to supporting local music, the festival is a major proponent of local cuisine and typically brings neighborhood eateries and foodie-favorite food trucks to serve concertgoers their zaniest, most adventurous recipes. The diversity of the cuisine matches that of the music; this year’s vendors haven’t been announced publicly, but dishes like gator sausage sandwiches, gourmet popsicles and chicken and waffle cones have been huge hits in years past. GMF’s first-ever exclusive beer sponsor, Tampa’s own Cigar City Brewing, is supporting the event with a “Gasparilla Music Festival Pilsner.” The brand new German-style brew was created specifically for the occasion and will be available for purchase on location during the festival. GMF is offering both single-day and full weekend passes; Saturday tickets are $40, Sunday tickets are $30 and two-day general admission passes are $60. Though they aren’t sold out quite yet, tickets are vanishing quickly, according to the Foundation’s twitter page. Volunteer options are available for those who might not be able to shell out the extra cash for tickets. Volunteers can spend one four-hour shift on either March 9 or 10 (the Thursday and Friday before festival weekend) helping to set up stages and vendor booths. In return, they’ll receive a single-day admission ticket free of charge. Since it’s a non-profit, the Foundation doesn’t keep the festival’s ticket sales for itself. Instead, the event’s earnings will finance the group’s independent music education and support programs throughout the year. For example, a monthly initiative called “Streetcar Live” sees different bands perform on historic Tampa trolleys. A “Recycled Tunes” program provides public schools in the area with new and refurbished instruments – people can exchange a used instrument for a free ticket to next weekend’s festival. This year’s festivities will include a number of wellness events as well, including a yoga and meditation station hosted by Dubb Tenn Yoga and a stationary bike ride called “Ride the Park,” endorsed by SOHO Cycles. For more information on the 2017 Gasparilla Music Festival, visit https://gasparillamusic.com.